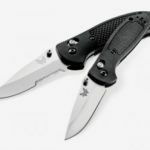 With an overall rating of 4.8 stars, gushing customer reviews, and a design that knocks your socks off, this knife is a clear winner. The rustproof H1 steel will hold up well underwater, even after repeated uses. 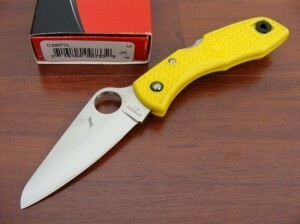 The knife itself is super light, easy to carry, and the blade is incredibly sharp. For just $65, it’s a bargain. 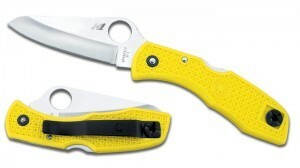 This knife should be thought of as an investment if you are a diver, kayaker, camper, fisherman, or outdoorsman. 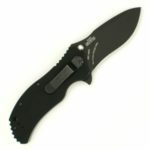 A knife like this is an essential tool for serious outdoor activities, and this knife is certainly the best in class. 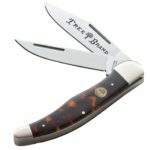 Buying this knife is a no-brainer if you’re a serious outdoorsman or enthusiast. You may have been a little taken aback by the mention of rust proof steel before. That was no exaggeration. The unique H1 steel constituting this blade will not rust. H1 steel was recently introduced to the market by a Japanese foundry. The H1 steel was produced specifically for use in and around water. 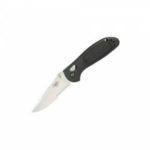 The H1 steel constituting the blade will not rust, and it is ideal for boaters and fishermen who need to perform tedious chores. It will not rust – even after years of exposure to water. Spyderco really did think of everything when it came to ensuring that this knife was impervious to water damage. All of the inside and outside steel components (clip, pins, and lock bar) have been specially treated to make them impervious to pitting and rust. Some knife blades will rust if you just look at them wrong. Why should you worry about rust all the time? Take advantage of this cutting-edge innovation (pun intended) and never worry about rust again. 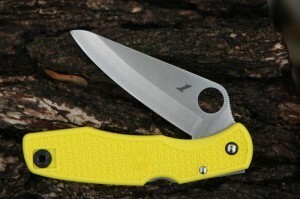 This knife has a smart size, versatile shape, and proven durability. Spyderco did a truly great thing in integrating H1 into this model. 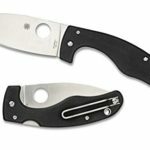 The Spyderco Round Hole (used for opening the knife) has been increased in size to 14mm, which facilitates easier access for wet or gloved hands. 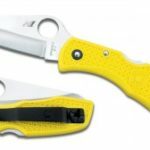 Spyderco did much to ensure that boaters and fishermen would have an easy time using this knife. Another example of this is the FRN handle, designed for friction-resistance to slipping. The volcano grip is incredibly innovative. There are divots molded into the FRN to offer solid traction in hand. 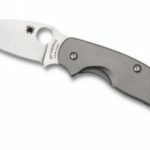 Spyderco thought about weight, too. One customer said that you could carry it all day without even noticing it is there. The solid yellow color is a brilliant choice. You’re not likely to lose this knife. Even if you drop at a campsite, the vivid yellow color will call attention to it almost immediately. You could find it even in the dense foliage and dead leaves of a forest floor. This is the knife you need for serious outdoor & aquatic activities.